Remember a few months ago when we told you about a big competition called the “Whisker Wars” that sought to determine people’s favorite, famous Internet cat ever? If you don’t, that’s okay — here’s a link to that post to refresh your memory. In the competition’s final round, Lil Bub pulled out ahead of Henri, le Chat Noir and was thus crowned as ’Net dwellers’ favorite feline. And even though the Whisker Wars ended over a month ago, the competition’s cats, their owners and Whisker Wars’ creator AmazeCats, are taking advantage of the buzz they created to do some good. Earlier this week, AmazeCats’ cofounder Megan Wilkinson reached out to tell us about the next exciting move for the Toronto-based organization, which seeks to create an online community for cat lovers everywhere. The young organization, founded last summer, also advocates for cats in need, and helping out other kitties is exactly what its latest endeavor, the Famous Cats of the Internet playing cards, will do. Each 54-card deck features totally adorable color photos of 13 of the famous kitties who competed in the Whisker Wars, and 100 percent of the proceeds from each $12 deck sold is being donated to Los Angeles-based Stray Cat Alliance. With its slogan “Building a No-Kill Nation, One Stray at a Time,” the national nonprofit Stray Cat Alliance works to educate people on how to care for stray and feral cats. Wilkinson says the idea to help homeless cats by selling the cards arose after she and the other four members of the AmazeCats team saw how positive fans’ responses were to the Whisker Wars. “I had been in contact with some of the cats’ owners through the Whisker Wars and because everyone was so engaged and it was a positive thing happening, we thought it would be cool to get them together on one project to help cats in need,” she says. Though not all of the competition’s 32 cats’ owners/creators responded to the idea, the deck features some of the most recognizable famous kitties: Henri, le Chat Noir, Lil Bub, Oskar the Blind Cat, Waffles, Luna the Fashion Kitty, Chase No Face, Colonel Meow, Pudge, Cooper the Photographer Cat, Nala, Spangles, Shishimaru and Sockington. You may also notice that most of these little furry faces have appeared in Cat Friday’s Celebri-cats installments. 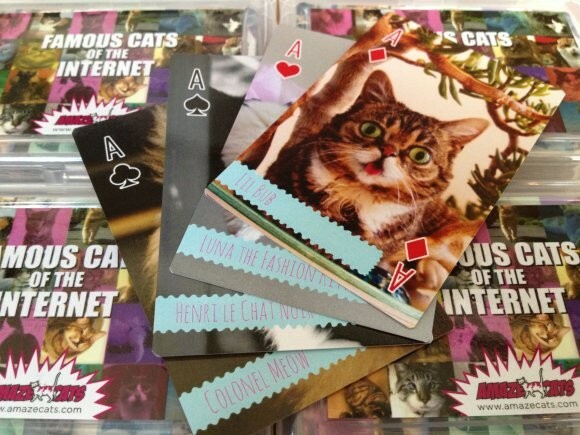 Since the Famous Cats of the Internet playing cards launched last Wednesday, Wilkinson says more than $2,000 has been raised so far for Stray Cat Alliance. 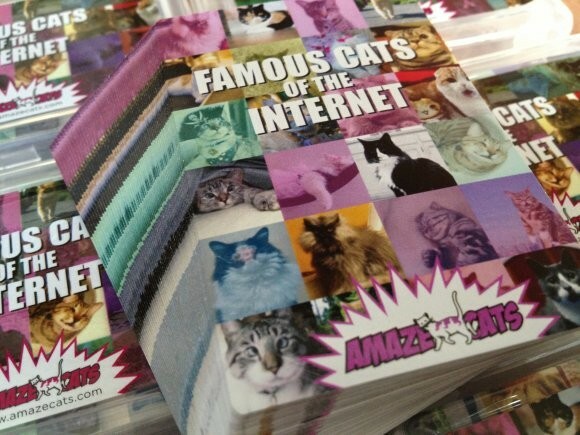 In addition to the charitable campaign through the Famous Cats cards, AmazeCats also offers other kitty-themed products for sale on its website, including a deck of cat tips cards, and a deck of cat fact cards. 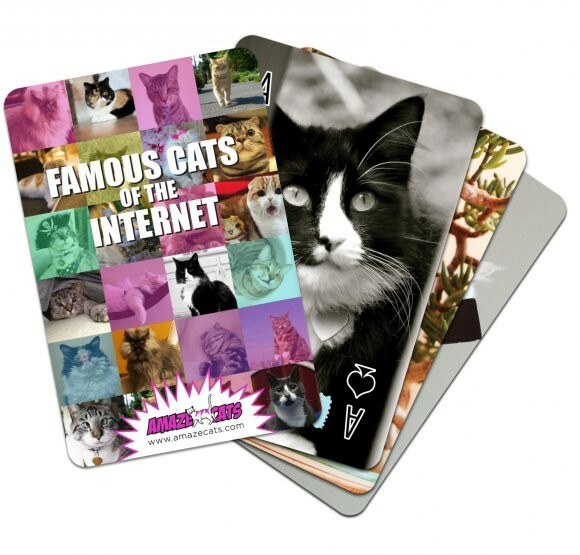 And if having a deck of playing cards with some of the world’s most beloved famous felines isn’t quite enough, get your own kitty's cute picture printed on a deck with AmazeCats’ personalized kitty playing cards. King’s Cup and Go Fish will never be the same again! While the Famous Cats playing cards just debuted, Wilkinson tells us the AmazeCats team is working on some new ideas for more a-mew-zing products in the future. “As we move forward we’ll have even more things for people to feature their cat and more ways to raise money for other animal organizations,” she says.